Welcome to the “Think Big” website. This site has been developed by the Honours Community of the Faculty of Social and Behavioural Sciences of Utrecht University. 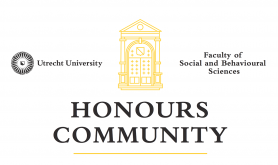 Our aim is to keep you posted on the latest activities and info regarding our Honours Community! Be sure to read the Honours Magazine: Think Big: it’s an Honour. The magazine consists of items regarding social and behavioural sciences, education and mental health care. Both (honours) students and professionals share their interests, opinions and latest experiences within their field.